There is nothing to complain about in terms of R + A’s build quality. 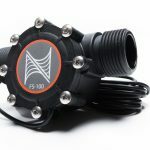 The pump is compact and very light, given its relatively good air rating. A hard plastic shell the size of a bar of soap protects the internal components. 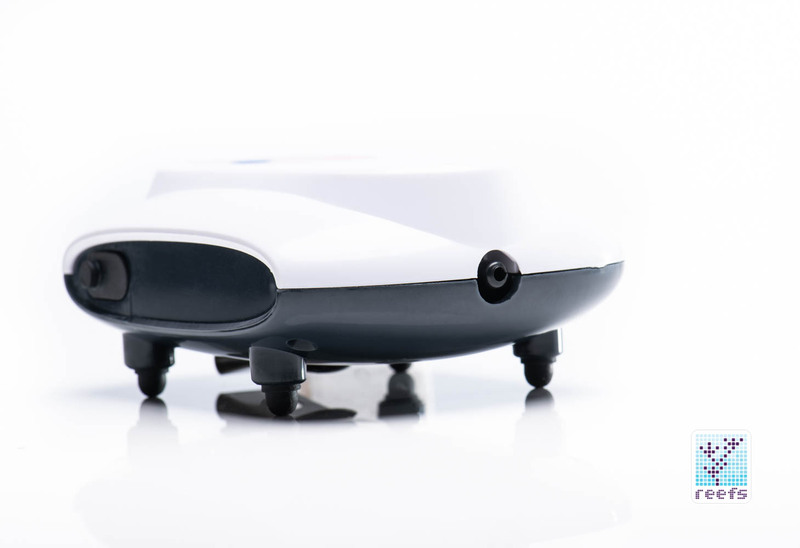 There are four rubber feet and a tank rim clip (for a ¼” glass thickness max) on the underside and an operation panel on the upper side. 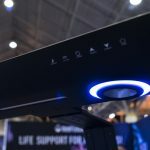 The panel features a four-bar power level indicator, an on/off and 10 sec pulse (more on that later) LED indicators, as well as a centrally located power/mode button. The right-hand side of the unit reveals a 1.5mm DC power connector protected by a rubber cover and in the front (up if hung by the clip) we have the airline outlet. 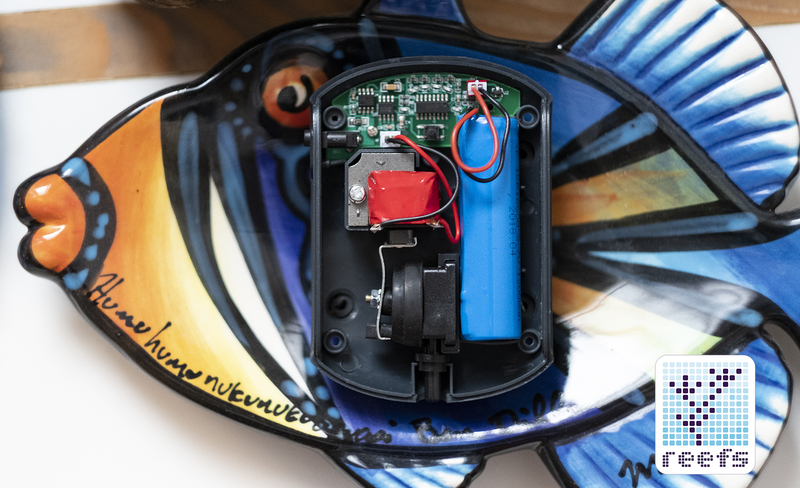 Taking the two halves of the cover apart reveals the tiny pump diaphragm, an AC/DC power converter, and a 1200mAh internal battery which the pump relies on for power when none comes out of the wall. 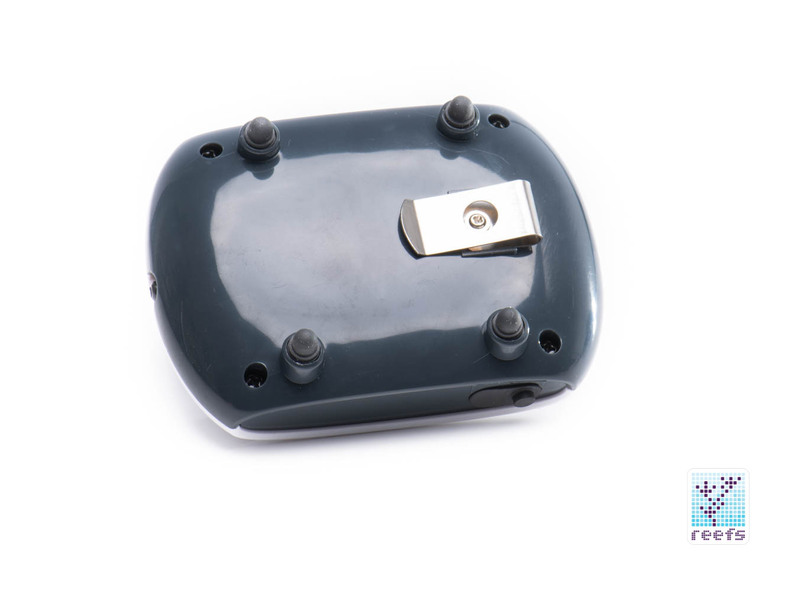 Although there is no gasket between the cover halves, Rescue + Air has a fully sealed operational panel and the earlier mentioned DC connector cover, which means that it can take some random splashes and high moisture from the tank. 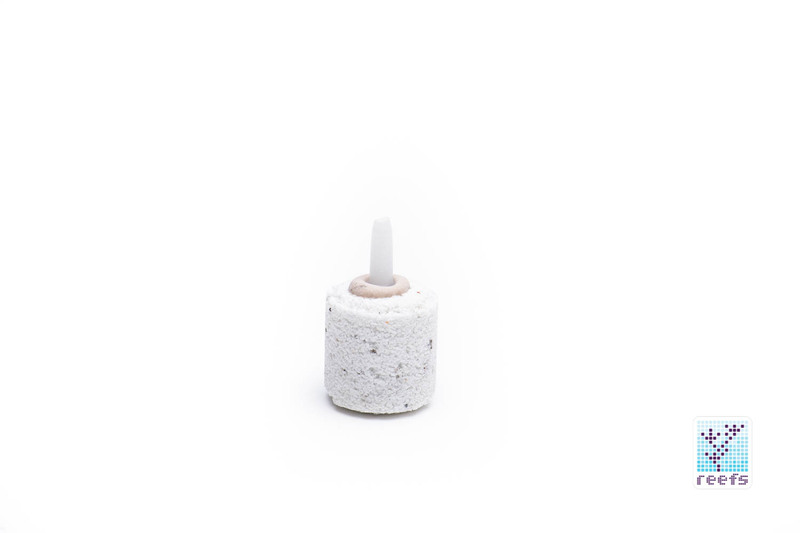 The airline that comes with R + A is of the flexible, silicone-based kind and although it’s a tad too short to be fully useful in larger aquaria, it is nevertheless a standard 3/16” and can be easily replaced with something longer should you need that. 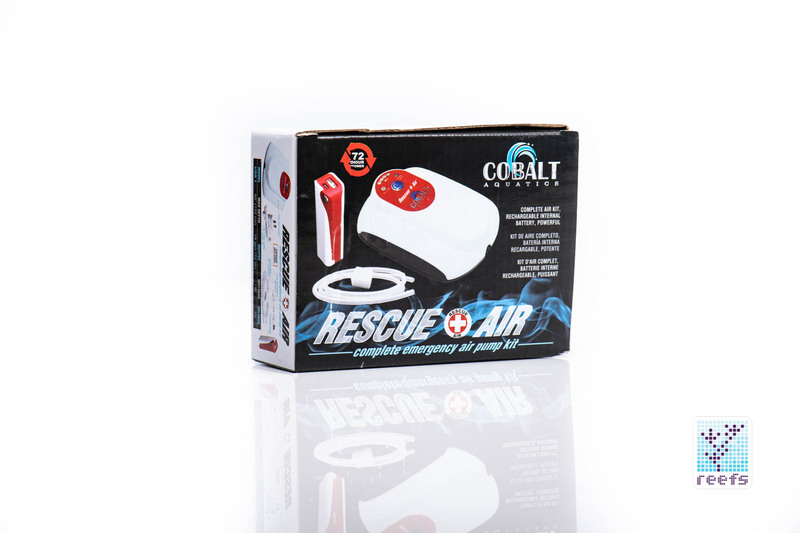 Rescue + Air comes with its own power bank and again, apart from boosting a matching color scheme with the pump, it is but a standard USB power bank, like the ones that people use to keep their phone charged on the go. You can even use it for that purpose if you wish. 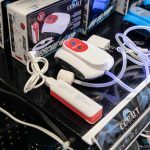 A 2600mAh cell inside translates into 48 more hours of operation, in addition to the 24h max running time of the pump’s internal battery. I give credit where credit’s due, but Cobalt deserves a little bit of criticism here. Although I was fully aware that when they advertise the pump’s battery provides UP TO 24h of uninterrupted power they meant “up to 24h in 10 sec pulse mode” (classic marketing gimmick), you can’t find that out from the packaging or from the printed instructions included in the package. 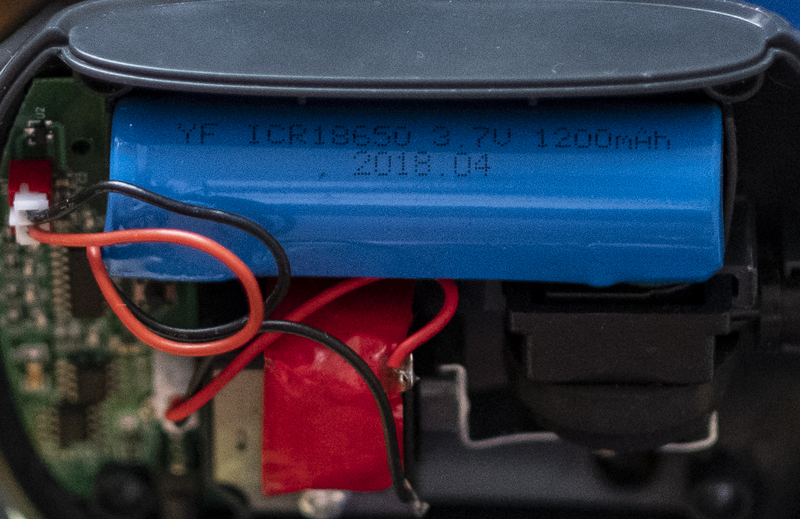 Hey Cobalt, you need to do some cleaning up in the labels, put a little asterix next to the 24/48h, ok? Nevertheless, 12/36 hours of air is an excellent result. To get 12 hours from my crappy “D” battery operated air pump, I had to drain two of those cells dead. Each one worth about $2.50. We have to put things into perspective- yes, it’s not 24h of constant air, but it’s also not $5 dollars spent every time you need to use it for that period of time. Many of you may also remember what can happen if you forget to take out the batteries and leave the pump in a humid environment- a slow-ticking time bomb. 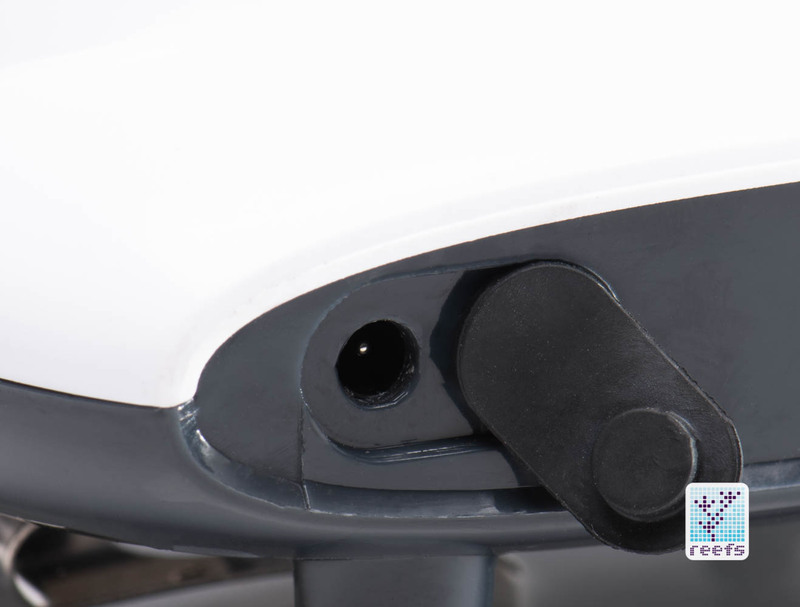 This is the area where Cobalt Aquatics really deserves praise, because the amount of functionality they manage to pack into the single button operated, ordinary looking pump is quite astounding. Let’s start with the obvious- R + A has a 5V powered DC pump that can be recharged via USB chargers. The amount of “juice” it provides just from its internal battery is more than enough to go through a full day of no power in the house. Now imagine how long it could last if you switch to a larger power bank. Well, I did just that and hooked the pump to a massive 28500mAh I’m using for car camping, turned the pump on and just left it there. I came back 7 days later and there was still one bar left on the power bank! Big, big thumbs up to Cobalt Aquatics for that. You can virtually have this thing running for weeks, given that you have at least two power banks and access to a USB car charger to recharge them. That’s not even the best thing that adds to R + A value…. Well, maybe it is, since having an emergency air pump that can run for days at a time is all you need from life. Anyway, the single, centrally located button that switches the pump on/off also switches between two pre-programmed modes- constant, which doesn’t need explanation, and a 10-second pulse, that turns the pump on in 10-second intervals, essentially doubling the battery life. Now check this out- if you plug Rescue + Air into a 120V outlet using the supplied power adaptor (or any USB charger for that matter), turn it on to see if it works and hit the power button again, the unit will go into the power outage mode. 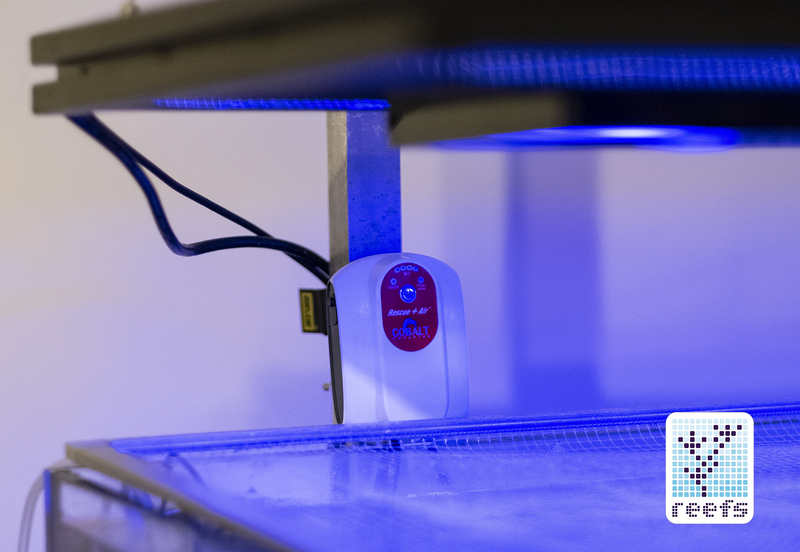 Approximately 5 seconds after the pump’s internal electronics senses the main power source is cut-off, it automatically turns on and switches to battery mode. Brilliant! 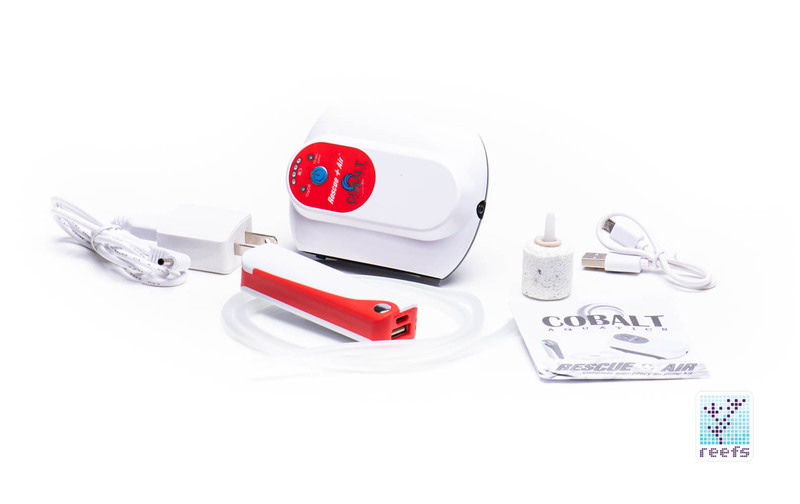 Who would have thought that Cobalt Aquatics could put so much functionality in a battery operated air pump? 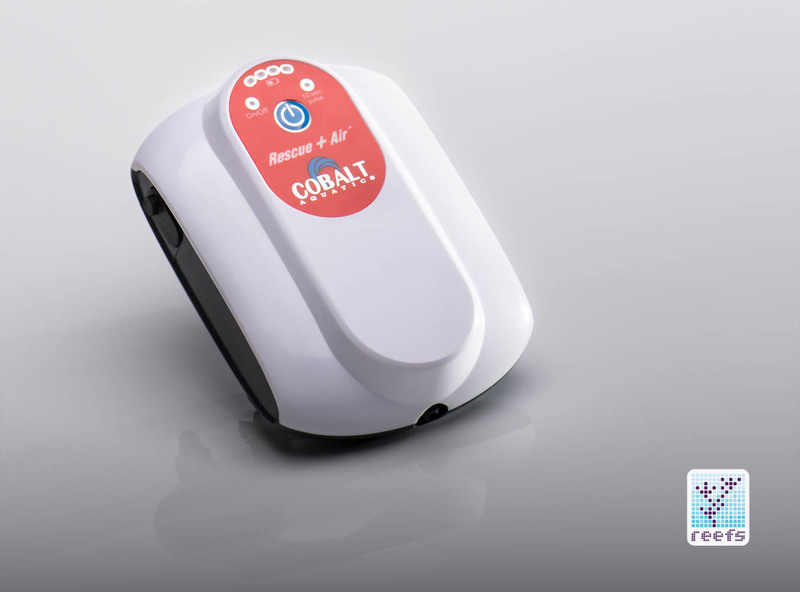 Rescue + Air represents an essential piece of equipment that has been radically improved in comparison to what we have dealt with for so many years. A device that every reefer out there should own, especially in today’s world where major weather episodes are becoming more frequent and more violent. 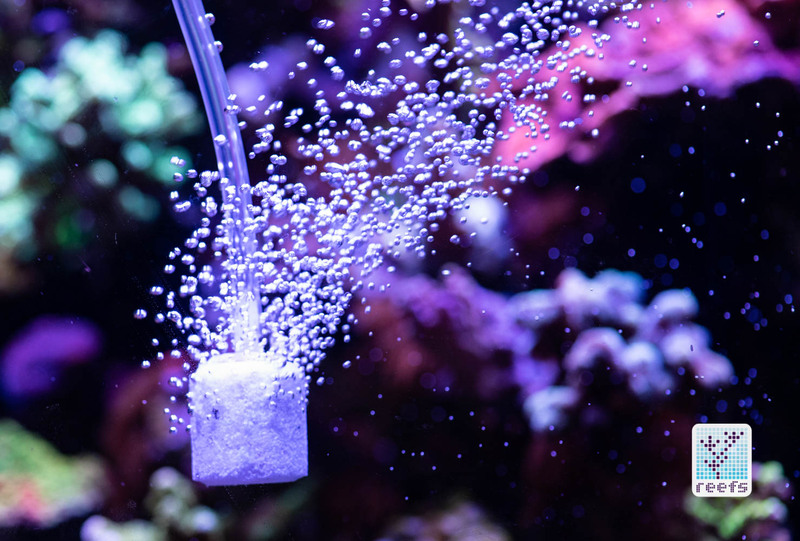 It can literally save your aquarium’s inhabitants from death by suffocation. Not only that, R + A provides a great way to keep the water oxygenated when transporting fish and other sensitive livestock. As I said at the beginning of this review, it’s a no-brainer. On the negatives, the previously mentioned misleading advertising. I took it for granted that 24h is in a 10-second interval mode, but some buyers may feel deceived by this less-than-clear labeling. I also wish the airline included in the package was a bit longer and that the power adaptor was a micro-USB type, which would allow me to use one of the many USB cables laying around, but those are relatively small flaws that can be corrected on the user end rather easily. 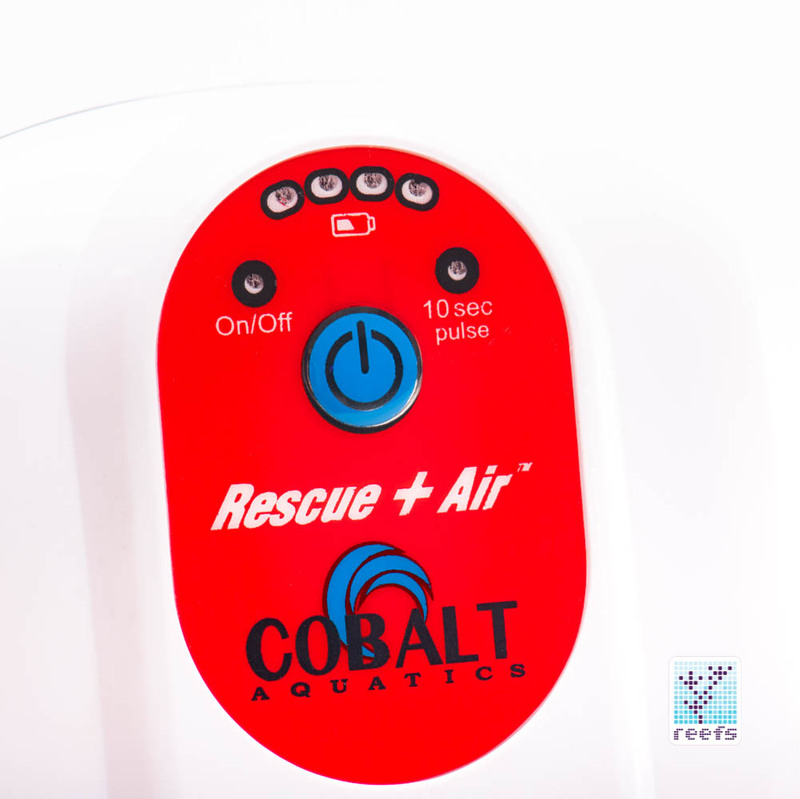 Rescue + Air sells for $39.99 and can be purchased at all major reef supply stores, as well as directly from the Cobalt Aquatics online store. 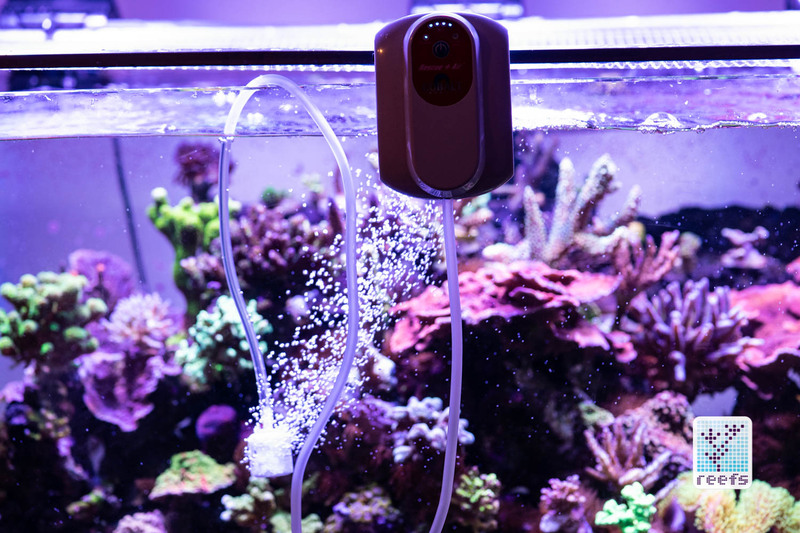 One final word before I hook up my R + A permanently to the back of my tank- if you look at it closer, this device opens a window to what could become a new era of aquarium specific emergency devices. By using the USB standard, the possibilities of implementing it in other devices seem endless. 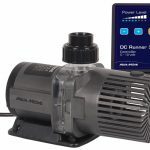 How about a small USB powered fan to keep temperature stable in a nano aquarium when power is off? Or a tiny powerhead that would provide water movement for hours, using power stored in batteries you may already own anyway? 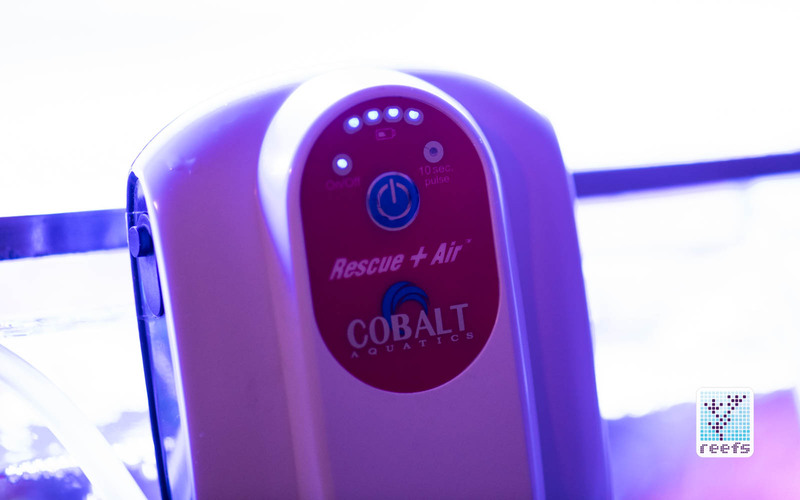 Cobalt Aquatics or others, get to it, I’m sure it will be another big hit, just like R + A. cobalt a Thanks for reading. 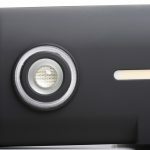 Now put your fancy LED light purchase on the back burner and get that pump. You will thank me, or rather Cobalt Aquatics for releasing it, later.